Cartridge yields approximately 400 pages. Acid-free, long lasting, water-resistant DURABrite™ ink. Ink does not bleed through paper. Epson T044220 (44) DURABrite Ink, Cyan - Standard capacity ink cartridges are designed for use with the Epson C64, C66, C84, C86, CX4600, CX6400 and CX6600. DURABrite inks produce bold black text and rich, vibrant colors and offer superior resistance to water, fading and smudging. 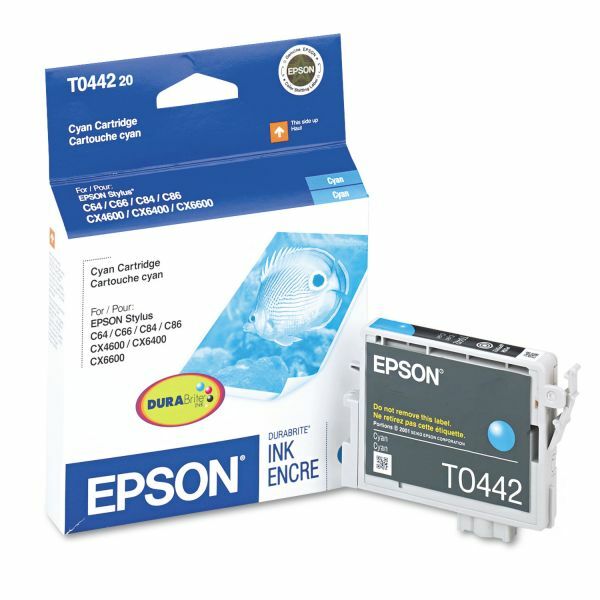 Excellent for double-sided printing because inks do not bleed through. Acid-free.